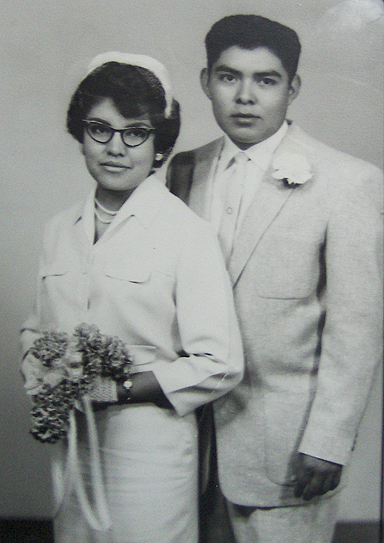 Dora Tse-Pé is from Zia Pueblo and married into San Ildefonso Pueblo. 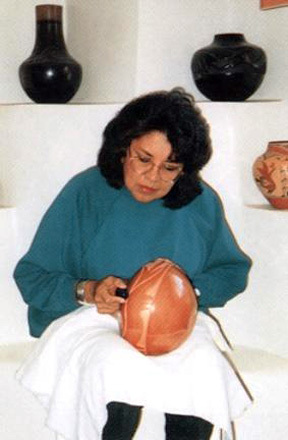 Dora was born in 1939 and married Tse-Pé, an innovative San Ildefonso potter in his own right. Dora has been exhibiting her work since 1969 and is continuing to win awards to this day. 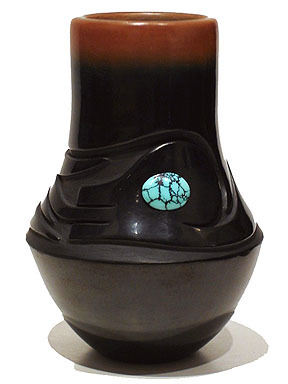 She is known for her exquisitely polished pottery in both blackware and redware. She learned pottery making from her mother Candelaria Gachupin and grandmother Rosalie Toribio. She was also greatly influenced by Maria Martinez' son Popovi Da and his son Tony Da. 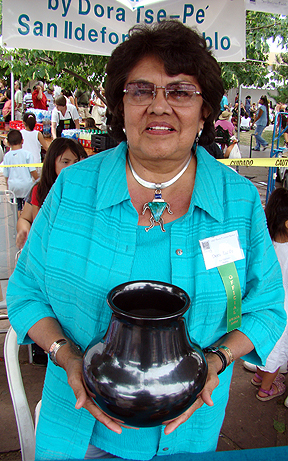 Dora's mother-in-law is Rose Gonzales, who also married into San Ildefonso Pueblo from Zia and is recognized as the innovator of deeply carved pottery. Rose was a great influence on Dora as well. 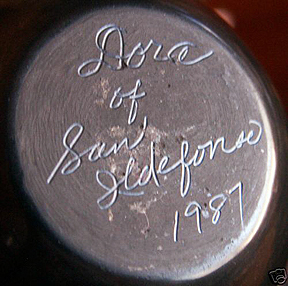 Dora's work is considered to be among the best work available today. She executes her pieces with a high degree of precision. This pot features a traditional olla shape with a straight neck. The carved area features a water serpent, or Avanyu. The Avanyu is a symbol of thanksgiving for water and rain. This intricately carved serpent has a beautiful, inlaid cabochon turquoise stone, measuring 3/4 in width, that serves as the serpent's eye. 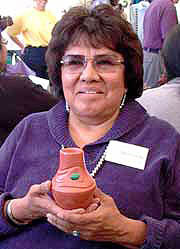 Dora was recently honored as one of the Masters of Indian Market in Santa Fe. She is featured in almost every book on Pueblo pottery published today. 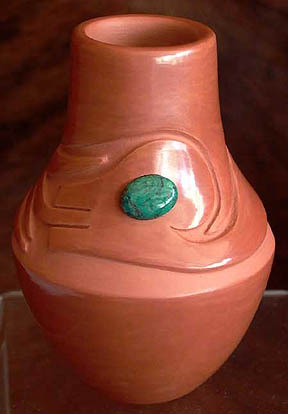 Rick Dillingham shows her work in 'Fourteen Families in Pueblo Pottery' on page 247 & 248, Allan Hayes features her in 'Southwestern Pottery from A to Z' on page 119 and 141 and Lee M. Cohen features Dora in 'Art of Clay' on pages 92-95. Gregory Schaff also features Dora Tse-Pé in his new book 'Pueblo Indian Pottery' on pages 226 and 227 and she is found in Susan Peterson's 'Pottery by American Indian Women' on pages 206-208. Dora Tse Pe moved from Zia to San Ildefonso more than 30 years ago and has been winning awards for her pottery since 1969. She is one of today’s most award-winning creators of Native American pottery and has been recognized as a 'Master' if the SWAIA Indian Market. Her work is in major museum and private collections and she has been featured in numerous publications. Dora learned to pot from her mother, Candelaria Gachupin, and mother-in-law, the famous, Rose Gonzales. She became an innovator, and as with this pot, periodically applies micaceous clay as a slip to get a glitter effect, fires in two tone and adds heishi to her pots. However, she is also a traditionalist, who collects and process her own clay and fires outdoors rather than use a kiln.